FOOD SAFETY: MONITORING CARBONATED SOFT DRINKS. The Food Safety and Standards Authority of India (FSSAI) has monitored and conducted checks on carbonated soft drinks to detect their deleterious effects on consumers. 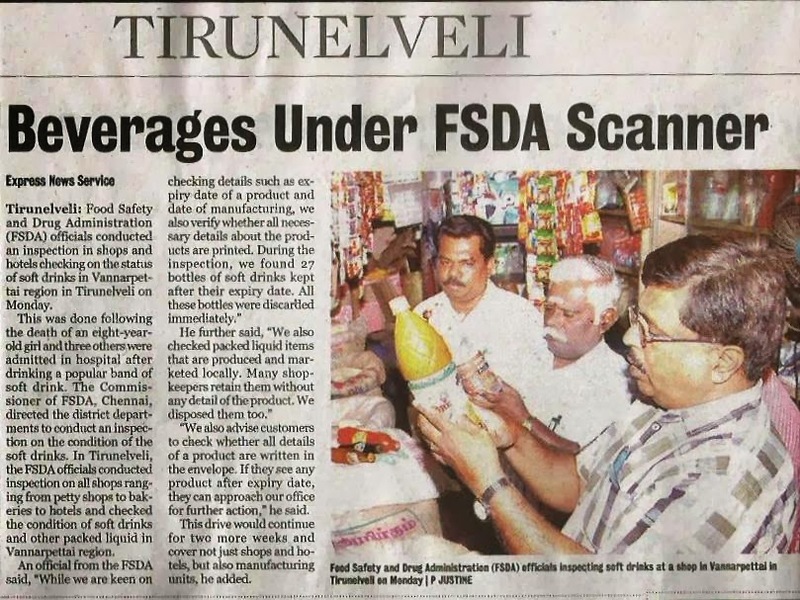 The FSSAI is the nodal agency for regulating manufacture, storage, distribution, sale and import of articles of food, has reported that as per information received from some of the State/UT Governments, total number of samples collected for the last three years and current year were 1552, out of which, 94 samples were found to be nonconforming with the prescribed standards. Legal action has been initiated by States/ UTs Governments against the manufacturing companies viz., M/s Coca cola, M/s Pepsico, M/s Priya Gold and M/s Mahaveer Food Beverages under the Food Safety and Standards Act, 2006. This above post is all about the beverages and soft-drinks.These are not good for health.Nice post.Thank you so much for sharing this informative post.